Being a professional athlete could be overwhelming and time consuming. It’s never easy going from playing a college sport to playing professional. So far, Dallas Cowboys’ rookies Dak Prescott and Ezekiel Elliott have had no problems making that transition. Who would have ever thought that the Cowboys would be 5-1 and in first place in the NFC East division looking like a Super Bowl team without some key stars producing like they should? Quarterback Tony Romo, who has yet to take a snap this season, continues to recover from yet another significant injury and wide receiver Dez Bryant has played in only three games and has not been playing up to his potential due to his own injuries. “America’s Team” has needed players to step up in a big way on the offensive end and that’s where these two young incredible athletes came into the picture. Prior to the start of the season, The Associated Press reported (via the Columbia Daily Tribune) that the decision to start Prescott and Elliott was the first of its kind since 1969 for the storied franchise. During that season, running back Calvin Hill (father of former NBA great Grant Hill) and future Hall of Famer Roger Staubach led the Cowboys to a 11-2 record and a conference championship berth, where they lost to the Cleveland Browns. The team was second in the NFL in scoring (369 points), and led the league in rushing yards (2,276) and total yards (5,122). Hill won the Offensive Rookie of the Year Award and was named All-Pro, as well as earned a spot in the Pro Bowl. The duo won Super Bowl VI together in 1972. Similar to the 6’3’’, 197 lb. Staubach, Prescott is a 6’2”, 226 lb. quarterback and was drafted 135th overall in the fourth round from Mississippi State. At the halfway point of the season, Prescott has a passer rating of 82.9, which is the top in the NFL. He has completed 68.7 percent of his passes and has thrown for 1,486 passing yards, seven touchdowns and one interception. The lone pick came in the team’s 30-16 win over the Green Bay Packers but prior to that game, Prescott broke the record for most passes to start a career with no interception. The previous record holder? Tom Brady. Needless to say, Prescott is off to one of the best quarterback starts in NFL history. Ezekiel Elliott is a 6’0”, 2251b. running back and was Dallas’ 1st round, fourth overall pick of this past draft. The former Ohio State Buckeye already has 703 rushing yards off 137 carries and five touchdowns. He is also averaging 5.1 yards per carry. With only six games of his rookie season, people are talking about him beating Eric Dickerson’s rookie record of 1,808 yards in 1983 with the Los Angeles Rams. But Elliott is not worried about the record. “So you guys made that story, but it’s honestly not something I’m very focused on. I’m focused on going out and winning ballgames. Focused on getting better with the team every week,” said Elliott to Fort Worth Star-Telgram reporter Drew Davison on October 12. Clearly, he has one thing on his mind, and that’s winning. These two have great chemistry on and off the field. Their roommates when the team stays at hotels before games. “They do everything together. They’re always together,” running back Alfred Morris said, via the Dallas Morning News on October 16. Prescott and Elliott have been close ever since they got drafted and showed up to rookie minicamp. 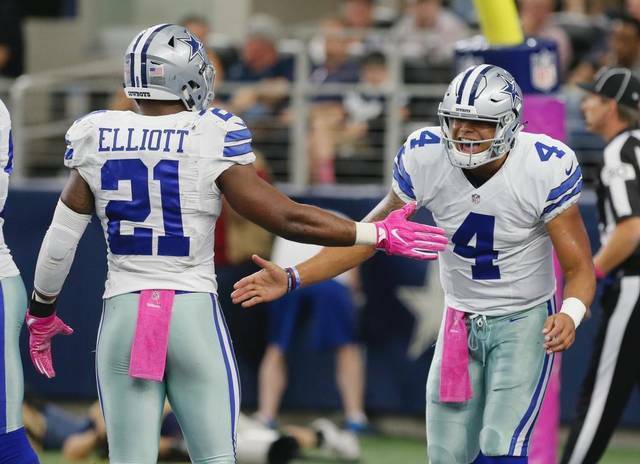 Prescott recently told the media that Elliott is “like a brother. We hang out often off the field and a lot in the locker room.” It’s rare for a quarterback to have great connection with their starting running back right away. This connection is showing on the gridiron every week. Last week the two rookies faced off against an Eagles team who has gotten off to a strong start, but lost their last game. Dalls beat the Eagles Sunday night 29-23 in Overtime from a game winning touchdown pass from Prescott. Every division game is important; and this one was no different. The question for the Cowboys coming off of their bye week will undoubtedly be: What will the Cowboys do when/if Romo is cleared? Based on the numbers the rookie duo is putting up, though, the answer should be pretty obvious.